The song Somewhere Over the Rainbow from the movie, The Wizard of Oz. Fry has been reading a reprint of an old Simpsons comic during the crew's journey to the Geek-e Galaxy. Their mission is to take the biggest comic collection in the universe back to Earth to be sealed in liquid diamond forever. However, they are soon interrupted by a zap from the Brain Spawn's stupefaction field. Fry, remembering his previous encounter with the brains, vows to stop them from destroying the Earth. Lacking any books, the pair of brains are soon forced to send the trio's minds into a nearby comic, which they quickly escape. Having found a spoiler ray, Bender forces them to reveal they are planning to collect comics so no-one can read them again and will move on to other literature which will reduce the I.Q. of Earth so they can invade. After Fry informs the Brain Spawn that the rest of Planet Express' staff will avenge them, the brains retrieve the others. The brains then send everyone into an original printing of a Simpsons comic, but thanks to another unintentional suggestion by Fry, the brains don't enter the comic themselves. While they aren't stupid, the group suffers some memory loss. Nibbler is able to help with this, until he looses focus when Quimby falls on him, as a result everyone except Fry and Nibbler has amnesia and wanders off. Promo pic for this comic. 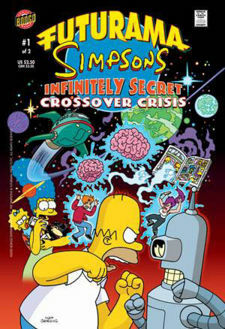 Simpsons comic #87 (Hail to the Cat), the Mental Realm visited in this comic, was not released until over a year after this crossover. The actual comic was based on the events of this comic. Writers incorrectly predicted in this issue that The Simpsons would first be broadcast in HDTV in 2005. In reality, this occurred in 2009. 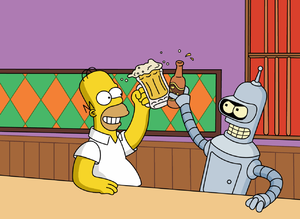 This was corrected for the release of The Simpsons Futurama Crossover Crisis in 2010. Nibbler's explanations suggest he knows of multiple people who have been trapped in books, understandable given the ongoing war between the Nibblonians and the Brain Spawn. Despite it never being shown, Skinner says that Scruffy's name is on his jacket. Leela: You'll wake up Nibbler! He looks so cute sleeping. Bender: Yeah, not like Fry, drooling all that blood and all. Professor: Let ME say it this time. Professor: Fry, you're an idiot. Narrator: Is all lost for the Planet Express crew? Are they finally, truly, totally boned? Brain Spawn #1: Yes, they are! Brain Spawn #2: Who are you talking to? This comic is set after (3ACV07) and before (4ACV10). Additionally, Fry states he is from the year 3002. Nerdanus 12 is a parody of the Marvel Comics character Ego the Living Planet. When Comic Book Guy gets into a car crash, he says "You are as blind as Matt Murdoch! ", referencing the alter ego of the Marvel superhero Daredevil. Bart's shirt changes from blue to orange. Scruffy's jacket is brown instead of it's usual blue. Technically, the Simpsons merchandise, aside from comics, should be wherever Nerdanus XII keeps his television related collection. It is unlikely he would be a fan of Simpsons comics and not watch the show, recordings of the show do still exist as Amy is a fan of the series. This page was last edited on 2 August 2014, at 18:36.